Back in the beginning of 2013 I was a young ambitious writer. I kept my writing skills up to par by occasionally writing some video game reviews. One of these games I played was Bioshock Infinite. And silly me wrote a review about the game after only finishing a quarter of it. Such a shame, because the game is a masterpiece! Well, I discovered that when I started playing it again last week. And boy what a great move that was. Bioshock Infinite was released on march the 26th 2013 and my Xbox achievements tell me that I played the game for a few hours the day after release. When the game became backwards compatible on Xbox One I tried to dive into it again, but for some reason I didn’t know what to do and, impatient as I was, I threw the game back into my pile of shame. 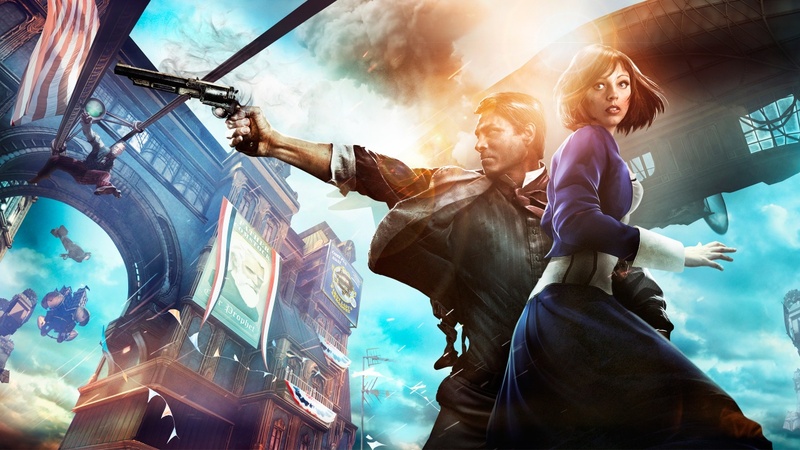 Until a week ago when I visited one of my favourite websites Howlongtobeat.com and saw Bioshock Infinite shining among the most popular games of the time. A lot has changed since five years ago. I had some private medical problems, but I also started working. Especially the latter meant that I needed to make well thought decisions about which game I would play during my sparse time. Howlongtobeat.com shows a top ‘so many’ games that are looked up the most and in between some new releases stood some all time classics in the making like my beloved Bioshock Infinite, The Witcher, Portal 2 and Irrational’s original magnum opus Bioshock. All classic games in the making and somewhat this triggered me to complete Bioshock Infinite after five long years. I wasn’t wrong, because the minute I jumped into dystopian Columbia, it felt like I never left the place. The game grabbed me right by my throat and didn’t let me go for a few days. A couple of times a day I was thinking about the next moment I could uncover a piece of the brilliant story Bioshock Infinite was telling me. And after the credits finally rolled down my screen, I can’t say I have made a better choice in my recent video gaming live. So there is quite a huge list of modern classic games I still need to finish. And now I know I will be able to! Despite the fact that I always thought my backlog was way to big to plough through off course. So what’s next? Well, probably Spec-Ops: The Line, Bioshock 2 and Dishonored. I don’t know yet, but all I can say is: Choose your video game wisely and keep on playing, folks!